for the historic moon landing in 1969. Flat cables are inherently more flexible than round cable. Flat cables occupy just 50% the space of comparable round cable. Flat cable brings simplicity and order compared to the messy spaghetti of round cable. Standard flexible flat cables are available for immediate purchase. Go here for specifications, pricing, or to place an order. Cable Assemblies, complete with the connectors of your choice, are available for any application. Go here to get design ideas, or to request a quote. Explore the technology behind our flat cables, and learn what makes them excel in the toughest applications. Register to view product pricing, maintain a library of your configuration drawings, and autofill all site forms. A great desk reference for Cicoil products, technology and capabilities. If you don't have one, get it here. Cicoil cable is unique. You need to see and touch it to understand. Go here to get your free samples. We send out application stories and usage tips about once a month. Sign up here for this valuable information. Our Video Library will show you numerous “How To”, “Why To”, and “Where To” use Cicoil Flat Cable video features. Our PDF Library contains loads of technical information and support documents. All documents are down loadable. Are you on Facebook? We are too! Click on the icon to see our FB page. LIKE it to join our growing audience. Cicoil invented flat cables in 1956, and we are the world’s leading manufacturer of flat cables and flat cable assemblies, complete with virtually any connector. In addition to our full line of standard cables, our Online Flat Cable Configurator lets you design literally millions of variations of flat cables, to exactly fit your needs. Our flat cables can easily combine power, signal, data, video, air, and liquid, all in one compact, sleek flat cable. Cicoil Flat Cables deliver significant advantages compared to round cables. Here are the 3 main reasons to Go Flat! 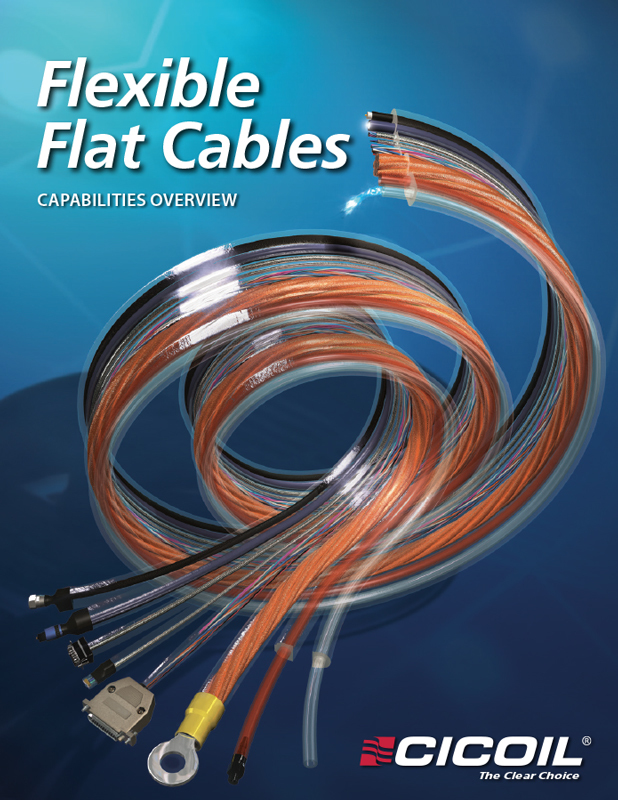 Cicoil Flat Cables are inherently more flexible than round cables. Flat Cables have very small bend radiuses, allowing them to fit in small spaces. Cicoil flat cables have a rated Flex Life of 10-20 Million Flex Cycles, and they often perform for more than 100 million flex cycles. Power, Signal, Data, Video, Air and Liquids can all be combined in one, compact flat cable, saving space and eliminating bulky, expensive cable tracks. Flat cables eliminate the mess and unreliability of individual wires, greatly simplifying your design. Cicoil’s exclusive Flexx-Sil jacket operates from -65°C to +260°C, and under exposure to water, sunlight, radiation, and most chemicals. Low Outgassing makes our Flat Cables ideal for vacuum applications, including satellite and space applications. Flexx-Sil is Class 1 Clean-Room rated, emits Zero Halogens, and is Flame Tested and Rated. Explore our Flat Cable Technology and products on our website, or call 661-295-1295 to speak directly to one of our engineers. We look forward to hearing from you, and to helping you Go Flat! This 8-page brochure offers a one page summary for each of Cicoil’s enhanced Standard Product groups, including features & benefits, applications; cable assembly capabilities; plus value added options. Learn more about our innovative flat cable technology and how Cicoil developed the first IDC Ribbon Cable, helped put a man on the moon, and designed the first Class 1 Clean Room Cable. It's all here in this free download. Enjoy!